... helped in the selection of the interior accessories. The three main working areas feature a custom made semi-polished stainless steel, 1cm (1/2 inch) thick with welded sinks, all made in Italy. ... Wall units in coal materia oak. SPACE Black finish aluminium equipped back panel and back panel in coal materia oak, stainless steel clad cooking hob area. E45 Open storage units in coal materia oak. Stainless Steel furniture for more hygiene, ergonomics and safety. ... space. The materials used are aluminium borders, laminated birch wood or folded aluminium, and bakelite, hydroxides or stainless steels for its work surfaces. A stainless steel kitchen may be preferred to kitchens in wood, laminate boards or other materials due to its robustness, scratch, moisture, stain and corrosion resistance, as well as its ease of maintenance. It is well suited to heavy use and environments which require high levels of hygiene, such as professional kitchens. On ArchiExpo, these kitchens are arranged by properties such as style or special features. 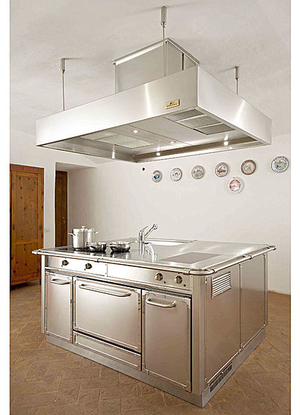 Stainless steel is employed in both home and commercial kitchens. At home, consider how the finish transforms room ambiance, as kitchens entirely of stainless steel may have a cold, industrial appearance. The incorporation of wood or other materials can add a touch of warmth or individuality. The steel used in a professional kitchen may have to comply with certain regulations. Consider ease of maintenance, longevity and robustness. Mobile units facilitate access and cleaning.